Shale formations in the United States are rapidly increasing as a source of natural gas and oil. Led by new applications of hydraulic fracturing technology and horizontal drilling, development of new sources of shale gas has offset declines in production from conventional gas reservoirs, and has led to major increases in reserves of US natural gas. Largely due to shale gas discoveries, estimated reserves of natural gas in the United States in 2008 were 35% higher than in 2006. In 2007, shale gas fields included the #2 (Barnett/Newark East) and #13 (Antrim) sources of natural gas in the United States in terms of gas volumes produced. The economic success of shale gas in the United States since 2000 has led to rapid development of shale gas in Canada, and, more recently, has spurred interest in shale gas possibilities in Europe, Asia, and Australia. It has been speculated there may be up to a 100 year supply of natural gas alone in the United States. U.S. shale deposits also cross over into Canadian provinces, such as Ontario. In May 2012 the International Energy Agency stated that the global exploitation of shale gas reserves could potentially transform the world's energy supply, but only if the industry can resolve the growing environmental concerns the practice of fracking raises. US shale gas production has grown rapidly in recent years as the natural gas industry has improved drilling and extraction methods while increasing exploration efforts. US shale production was 2.02 cubic feet in 2008, a jump of 71% over the previous year. In 2009, US shale gas production grew 54% to 3.11 cubic feet, while remaining proven US shale reserves at year-end 2009 increased 76% to 60.6 cubic feet. In its Annual Energy Outlook for 2011, the US Energy Information Administration (EIA) more than doubled its estimate of technically recoverable shale gas reserves in the US, to 827 cubic feet from 353 cubic feet, by including data from drilling results in new shale fields, such as the Marcellus, Haynesville, and Eagle Ford shales. Shale production is projected to increase from 23% of total US gas production in 2010 to 49% by 2035. The availability of large shale gas reserves in the US has led some to propose natural gas-fired power plants as lower-carbon emission replacements for coal plants, and as backup power sources for wind energy. In 2011, though, a news report found that "not everyone in the Energy Information Administration agrees" with the optimistic projections of reserves, and questioned the impartiality of some of the reports issued by the agency. Two of the primary contractors, Intek and Advanced Resources International, which provided information for the reports also have major clients in the oil and gas industry. "The president of Advanced Resources, Vello A. Kuuskraa, is also a stockholder and board member of Southwestern Energy, an energy company heavily involved in drilling for gas" in the Fayetteville Shale, according to the report in The New York Times. The current EIA administrator, Richard G. Newell, a vocal supporter of the industry prospects, announced in June his plans to resign to take a job at Duke University. The news report and one from the previous day on the same general subject by the same journalist attracted critiques from bloggers at Forbes and the Council on Foreign Relations, to name two. Diane Rehm had Urbina; Seamus McGraw, writer and author of "The End of Country"; Tony Ingraffea, a professor of engineering at Cornell; and John Hanger, former secretary of Pennsylvania Department of Environmental Protection; on a radio call-in show about Urbino's articles and the broader subject. The associations representing the natural gas industry, such as America's Natural Gas Alliance, were invited to be on the program but declined. The Antrim Shale of Upper Devonian age produces along a belt across the northern part of the Michigan Basin. Although the Antrim Shale has produced gas since the 1940s, the play was not active until the late 1980s. During the 1990s, theal drilling is not widely used. Unlike other shale gas plays such as the Barnett Shale, the natural gas from the Antrim appears to be biogenic gas generated by the action of bacteria on the organic-rich rock. The first Barnett Shale well was completed in 1981 in Wise County. Drilling expanded greatly in the past several years due to higher natural gas prices and use of horizontal wells to increase production. In contrast to older shale gas plays, such as the Antrim Shale, the New Albany Shale, and the Ohio Shale, the Barnett Shale completions are much deeper (up to 8,000 feet). The thickness of the Barnett varies from 100 to 1000 feet, but most economic wells are located where the shale is between 300 and 600 feet thick. The success of the Barnett has spurred exploration of other deep shales. In 2007, the Barnett shale (Newark East) gas field produced 1.11 cubic feet of gas, making it the second-largest source of natural gas in the United States. The Barnett shale currently produces more than 6% of US natural gas production. The Caney Shale in the Arkoma Basin is the stratigraphic equivalent of the Barnett Shale in the Ft. Worth Basin. The formation has become a gas producer since the large success of the Barnett play. Bill Grieser: Caney Shale, Oklahoma's shale challenge, PDF file, retrieved 25 February 2009. The Mississippian Fayetteville Shale produces gas in the Arkansas part of the Arkoma Basin. The productive section varies in thickness from 50 to 550 feet, and in depth from 1500 to 6500 feet. The shale gas was originally produced through vertical wells, but operators are increasingly going to horizontal wells in the Fayetteville. Producers include SEECO a subsidiary of Southwestern Energy Co. who discovered the play, Chesapeake Energy, Noble Energy Corp., XTO Energy Inc., Contango Oil & Gas Co., Edge Petroleum Corp., Triangle Petroleum Corp., and Kerogen Resources Inc.
Bill Barrett Corporation has drilled and completed several gas wells in the Gothic Shale. The wells are in Montezuma County, Colorado, in the southeast part of the Paradox basin. A horizontal well in the Gothic flowed 5,700 MCF per day. Although the Jurassic Haynesville Shale of northwest Louisiana has produced gas since 1905, it has been the focus of modern shale gas activity only since a gas discovery drilled by Cubic Energy in November 2007. The Cubic Energy discovery was followed by a March 2008 announcement by Chesapeake Energy that it had completed a Haynesville shale gas well. Haynesville shale wells have also been drilled in northeast Texas, where it is also known as the Bossier Shale. It's been reported that Encana Corporation "plans will run two to four rigs to drill up to 50 wells in 2014 on 176,000 leased acres in the Mancos shale [in New Mexico] ... The company will spend $350 million in the Mancos Shale in 2014." Additionally, the company would be exploring for oil in southwestern Colorado's portion of the Mancos Shale. Encana will be exploring for natural gas as well as oil in both New Mexico and Colorado. In California the Monterey Shale is a rib-shaped formation that extends from northern California down to the Los Angeles area, offshore, and onto the outlying islands. The Monterey Shale Formation is currently producing oil & natural gas and is an emerging shale play. Counties include Kern County, Orange County, Ventura County, Monterey County and Santa Barbara County, California. The Monterey Shale is composed of a concoction of many substances including folded mud deposits and highly dense chert. The Venoco CEO stated their might be up to 300 billion barrels of oil in the Monterey Shale but their first well was labeled " uneconomical." The Monterey Shale, while it consists of both oil and gas, is primarily oil. Extraction is focused mainly from vertical drilling techniques versus the costly horizontal technique used for most shale gas plays. Natural Gas estimates in the Monterey Shale stop at between 1.5-2.0 trillion cubic feet. The Devonian-Mississippian New Albany Shale produces gas in the southeast Illinois Basin in Illinois, Indiana, and Kentucky. The New Albany has been a gas producer in this area for more than 100 years, but recent higher gas prices and improved well completion technology have increased drilling activity. Wells are 250 to 2000 feet deep. The gas is described as having a mixed biogenic and thermogenic origin. Operators have completed approximately 50 wells in the Pearsall Shale in the Maverick Basin of south Texas. The most active company in the play has been TXCO Resources, although EnCana and Anadarko Petroleum have also acquired large land positions in the basin. The gas wells had all been vertical until 2008, when TXCO drilled and completed a number of horizontal wells. The Marcellus Shale in West Virginia, Pennsylvania, and New York, once thought to be played out, is now estimated to hold 168-516 cubic feet still available with horizontal drilling. It has been suggested that the Marcellus shale and other Devonian shales of the Appalachian Basin, could supply the northeast U.S. with natural gas. In November 2008, Chesapeake Energy, which held 1.8 million net acres of oil and gas leases in the Marcellus trend, sold a 32.5% interest in its leases to Statoil of Norway, for $3.375 billion. Go Marcellus Shale A forum for the Marcellus Shale. In October 2009, the Canadian company Gastem, which has been drilling gas wells into the Ordivicia Utica Shale in Quebec, drilled the first of its three state-permitted Utica Shale wells in New York. The first well drilled was in Otsego County, New York. The Devonian Woodford Shale in Oklahoma is from 50 to 300 feet (15 – 91 m) thick. Although the first gas production was recorded in 1939, by late 2004, there were only 24 Woodford Shale gas wells. By early 2008, there were more than 750 Woodford gas wells. Like many shale gas plays, the Woodford started with vertical wells, then became dominantly a play of horizontal wells. The play is mostly in the Arkoma Basin of southeast Oklahoma, but some drilling has extended the play west into the Anadarko Basin and south into the Ardmore Basin. The largest gas producer from the Woodford is Newfield Exploration; other operators include Devon Energy, Chesapeake Energy, Cimarex Energy, Antero Resources, St. Mary Land and Exploration, XTO Energy, Pablo Energy, Petroquest Energy, Continental Resources, and Range Resources. 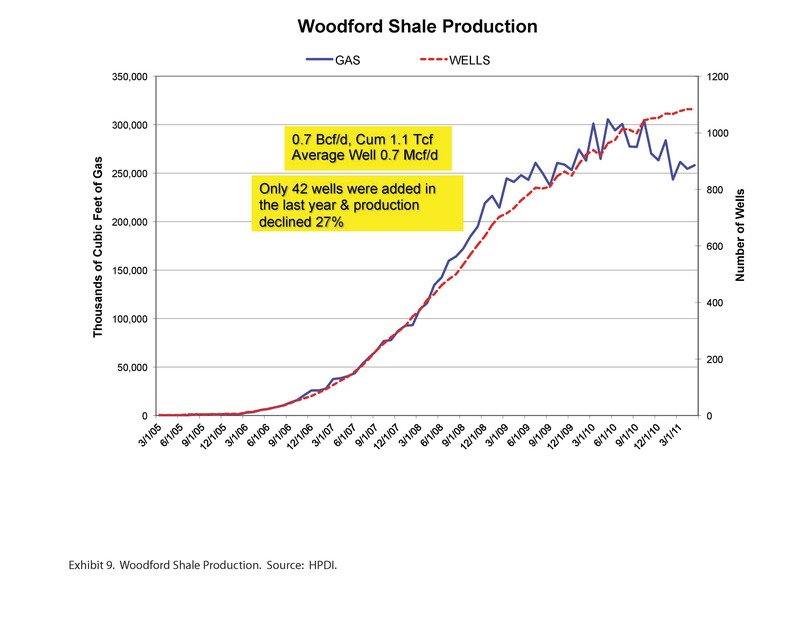 Production from the Woodford Shale has peaked and is now in decline, however. 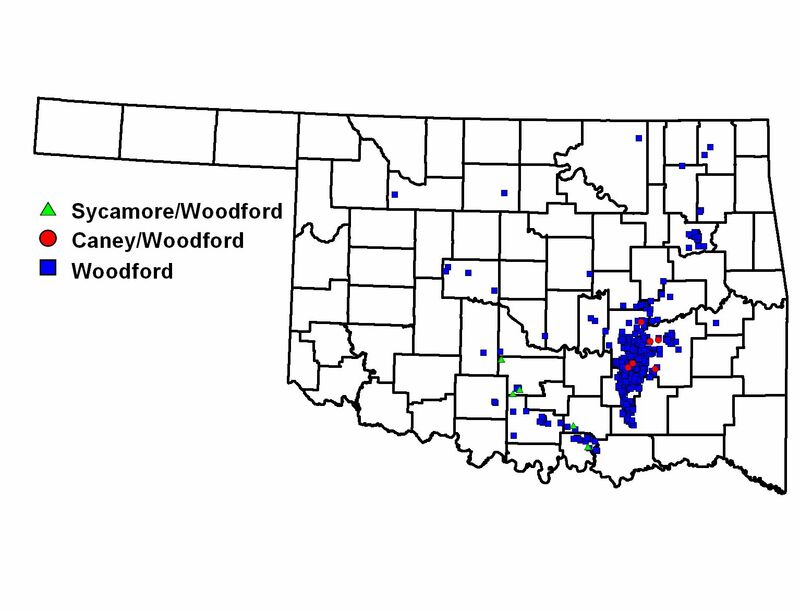 Oklahoma Geological Survey: Map of Woodford shale wells, accessed 25 February 2009. Brian J. Cardott: Overview of Woodford gas-shale play in Oklahoma, 2008 update, PDF file, retrieved 25 February 2009. Exploratory wells have been drilled along the Bakken formation in Montana with active wells already producing oil in North Dakota. Experts say oil appears to extend from the Bakken formation of eastern Montana into Alberta, and south to the foot of the Rocky Mountains. It has been reported that hydraulic fracking will likely be required to extract the oil, if it is found. Land leases for fracking in the region have increased dramatically in recent years. In North Dakota, fracking is already underway in the state's section of the Bakken. Fracking in this area is extracting oil and not natural gas. The year of 2011 saw an increase of 35 percent in natural gas production, and it is estimated that 2012 will see an even bigger boom, in large part because of falling natural gas prices. As such it is estimated that North Dakota should overtake Alaska as the second-largest U.S. producer, only behind Wyoming. In 2008 the United States Geological Survey estimated that 148 million barrels of natural gas resided in the Bakken formation. ↑ Jad Mouawad, "Estimate places natural gas reserves 35% higher,", New York Times, 17 June 2009, accessed 25 October 2009. ↑ US Energy Information Administration, Top 100 oil and gas fields, PDF file, retrieved 18 February 2009. ↑ "What the Frack? ", Slate (2011-12-29). Retrieved on 2011-01-25. ↑ "Shale Gas Boom at Risk Over Environment Failings" James Herron, Wall Street Journal, May 29, 2012. ↑ Simon Mauger, Dana Bozbiciu (2011). How Changing Gas Supply Cost Leads to Surging Production. Retrieved on 2011-05-10. ↑ US Energy information Administration, Shale gas production, accessed 4 December 2009. ↑ US Energy information Administration, "Summary: US Crude Oil, Natural Gas, and Natural Gas Liquids Proved Reserves 2009", http://www.eia.gov/pub/oil_gas/natural_gas/data_publications/crude_oil_natural_gas_reserves/current/pdf/arrsummary.pdf, accessed 5 January 2011. ↑ Annual Energy Outlook 2012 Early Release Overview. Retrieved on 27 January 2012. ↑ Peter Behr and Christa Marshall, "Is shale gas the climate bill's new bargaining chip?," New York Times, 5 August 2009. ↑ Tom Gjelten, "Rediscovering natural gas by hitting rock bottom," National Public Radio, 22 September 2009. ↑ Urbina, Ian, "Behind Veneer, Doubt on Future of Natural Gas", The New York Times, June 26, 2011. Retrieved 2011-06-27. ↑ Helman, Christopher, "New York Times Is All Hot Air On Shale Gas", Forbes, June 27, 2011 1:37 pm. Retrieved 2011-06-27. ↑ Levi, Michael, "Is Shale Gas a Ponzi Scheme? ", Council on Foreign Relations website, June 27, 2011. The earlier Urbina article was “‘Enron Moment’: Insiders Sound Alarm amid a Natural Gas Rush”. Retrieved 2011-06-27. ↑ "Natural Gas: Promise and Perils", Diane Rehm Show, NPR via WAMU, June 28, 2011. Retrieved 2011-06-29. ↑ Scott R. Reevbasins invigorate U.S. gas shales play, urnal, 22 Jan. 1996, p.53-58. ↑ "Could the Mancos Shale be the next big thing? Encana says yes" Nicholas Sakelaris, Dallas Business Journal, April 10, 2014. ↑ "Industry touts major Mancos Shale play" Emery Cowan, The Durango Herald, March 18, 2013. ↑ Alan Petzet (2007-08-13). "More operators eye Maverick shale gas, tar sand potential". Oil & Gas Journal 107: 38–40. PennWell Corporation. Retrieved on 2009-07-07. ↑ "Maverick fracs unlock gas in Pearsall Shale" (2007-08-25). Oil & Gas Journal 107: 32–34. PennWell Corporation. Retrieved on 2009-07-07. ↑ Arthur J. Pyron (2008-04-21). "Appalachian basin's Devonian: more than a "new Barnett shale"". Oil & Gas Journal 106 (15): 38–40. PennWell Corporation. Retrieved on 2009-07-07. ↑ "Chesapeake announces joint venture agreement", World Oil, December 2008, p.106. ↑ Travis Vulgamore and others, "Hydraulic fracturing diagnostics help optimize stimulations of Woodford Shale horizontals," American Oil and Gas Reporter, Mar. 2008, p.66-79. ↑ David Brown, "Big potential boosts Woodford," AAPG Explorer, July 2008, p.12-16. ↑ "Montana Fracking: Meeting On Potential Oil Development Draws A Crowd" Huff Post Green, March 5, 2012. ↑ "Assessment of Undiscovered Oil Resources in the Devonian-Mississippian Bakken Formation, Williston Basin Province, Montana and North Dakota, 2008" USGS, April 2008. ↑ "North Dakota: Site Of A Natural Gas And Oil Fracking Boom" International Business Times, March 19, 2012. Wikipedia also has an article on Shale formations in the United States. This article may use content from the Wikipedia article under the terms of the GFDL. This page was last edited on 4 September 2014, at 21:26.